Yoshida Sake Store (旧吉田屋酒店) is one of remaining Edo Style building located in Ueno area. Yoshida Store was a sake store since Edo period. 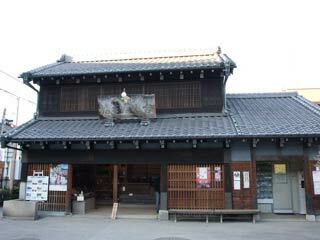 The building offers the Sake store of Edo period. It was donated to Taito ward, then it was reconstructed and restored in order to hand down the form of the liquor store of the early in the 20th century to future generations. It was originally built in 1910, partly reconstructed in 1935. Its long eaves and wide entrance are characteristics of such merchant building, and the first floor was counter and an office, the second floor was an employee's room. The warehouse was restored only on the outside based on a picture in 1910 and a Japanese-style room behind a counter was added for reinforcement of the building.